I'm back this week with yet more discouraging "news" for Trader Joe's line of bath and beauty products, which I have been a fan of. Last week I mentioned that I found the formula of Trader Joe's Nourish Shea Butter Hand Cream to degrade over time, eventually taking on a tacky texture. 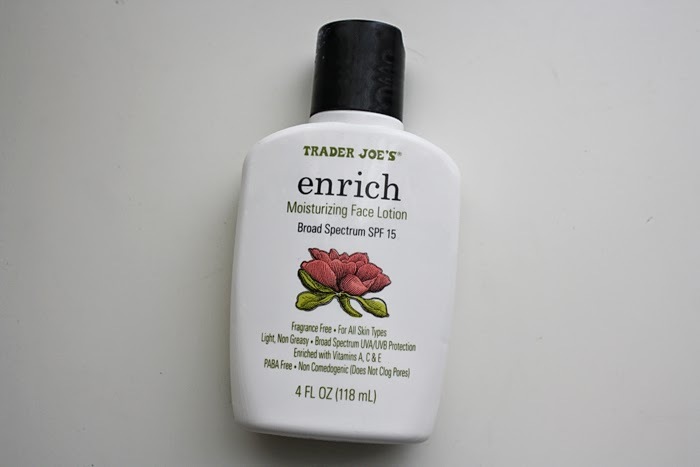 This week, I'm going to be talking about Trader Joe's Enrich Moisturizing Face Lotion with Broad Spectrum SPF 15 and one of the ingredients that goes into it. I originally purchased the Enrich moisturizer because it was PABA free and paraben-free, and I grew to love it because it did not make my face greasy like all other SPF moisturizers I'd tried had, and because it was thick and moisturizing to boot. Unfortunately, it does contain the ingredient retinyl palmitate which studies suggest that, when exposed to sunlight, produces a higher rate of skin tumors. Retinyl palmitate is a form of Vitamin A that was found to exist in 12% of daily sunscreen moisturizers in EWG's database. Officially, the FDA has not made a statement about the presence of retinyl palmitate in sunscreen, but Truth in Aging says, "According to FDA scientists, retinyl palmitate breaks down in sunlight to photomutagenic compounds, forming free radicals in the presence of UVA and UVB radiation. However, the FDA's final assessment has not yet been made public." Retin-A and retinoids are derived from Vitamin A, which is often used in skincare to help with acne or wrinkles (by boosting collagen, peeling off the top layer of skin and thickening those below it). Retinyl palmitate is considered an exfoliator (albeit more gentle than pure retinol), and its effect of repeatedly shedding the upper dermal layer forces the skin to produce new cells. There is some concern that at the Hayflick Limit (the number of times skin can regenerate itself before reaching its limit), the aging process will actually accelerate because cells are unable to multiply indefinitely. ... retinyl palmitate is one of the primary antioxidants found naturally in skin (Source: Toxicology and Industrial Health, May 2006, pages 181-191). Moreover, when retinyl palmitate is properly formulated in sunscreens (meaning stabilizing ingredients are included, which is typical) it does not pose a problem or health risk (Source: Photochemistry and Photobiology, November-December 2010, pages 1,390-1,396). Retinyl palmitate has been shown in UVB exposure studies to offer sun protection all by itself, and it is a potent antioxidant (Sources: International Journal of Pharmaceutics, October 2007, pages 181–189; and Journal of Investigative Dermatology, November 2003, pages 1,163–1,167). Still, it's all really enough science for me to want to back slowly away from retinyl palmitate, especially since I'm not yet at the point of using anti-aging products. Unfortunately for me, just before I discovered the controversy surrounding retinyl palmitate, I purchased my second bottle of Trader Joe's Enrich moisturizer. How's Trader Joe's return policy? + Huffington Post: Vitamin A: Skin Friend or Foe?